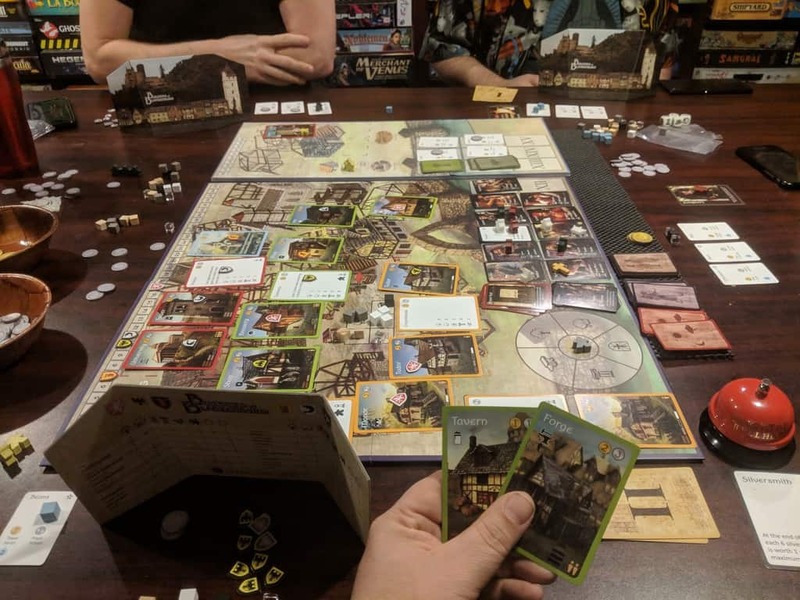 This past week I continued to get in plays of Cypress Legacy and Builders of Blankenburg. Besides playing actual physical games I’ve also been playing on Board Game Arena. 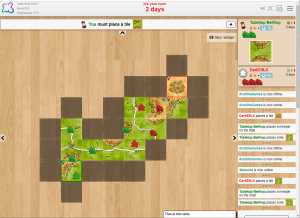 Of note this week is that Sean and I played a two-player game of Carcassonne. It was my first time playing this classic online. Disclosure: Both of the games talked about this week were provided by the publisher for me to review. As well, some links in this post are affiliate links. As an associate, I earn from qualifying purchases. There is no cost to you, we just get a small kickback if you buy something through one of these links. Using links like these helps to keep this blog and podcast going. On Monday we played a four player game of Builders of Blankenburg, again using the Fields and Flocks expansion. This expansion hasn’t been produced yet. 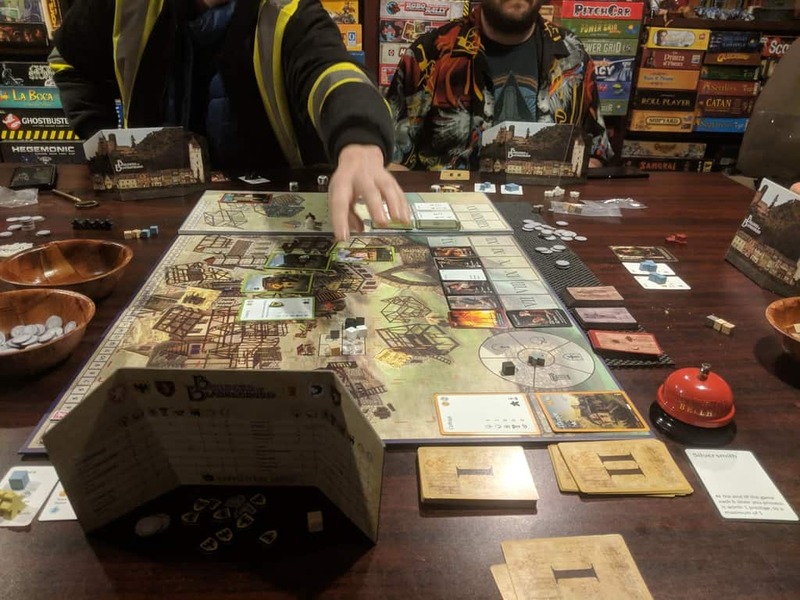 We were playing a prototype copy I got from Cobblestone games. This copy is not a final production copy and is not production quality. So take that into account when reading this and checking out the pictures. At this point, I think I’ve finally fully groked Fields and Flocks. I triple checked the rules and even emailed the designer on a couple of things. I don’t think we messed anything up this time. What’s very good to see is that gameplay has improved with each play. Which means that the proper rules work well and that the game does reward repeated plays. Another thing I’ve now noticed is how different each game has felt. The order the citizens come out each game really changes things up, as do the events and visitors. I can say, with 100% confidence, that no two games of Builders of Blankenburg are going to be the same. At this point, I have to say that I dig Fields and Flocks and what it adds to the game. The whole worker placement mini-game is engaging and does add to the base game. My only real complaint, and it’s not much of one, is that the game length pretty much doubles when you use Fields and Flocks. 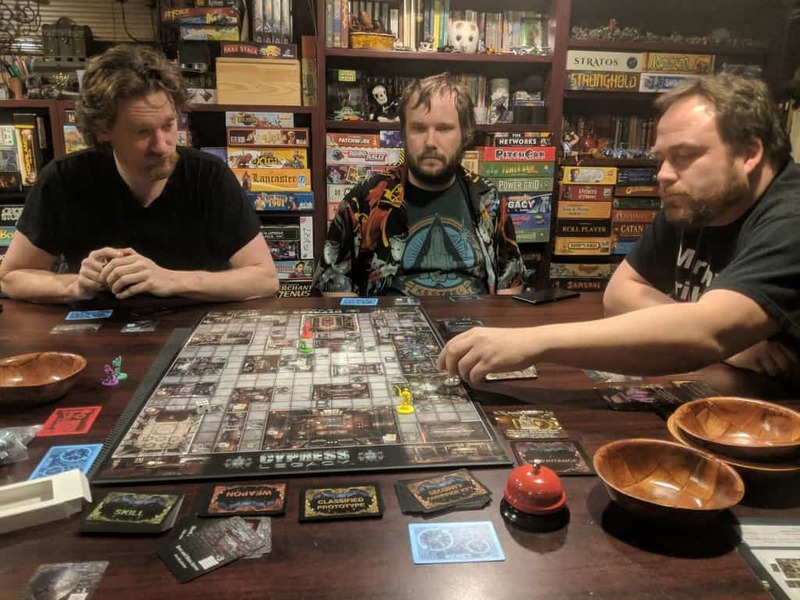 This isn’t necessarily a bad thing but something you need to take into consideration when planning your game night. Look for a full preview write up here on the blog sometime in the near future. The other game we played on Monday night was Cypress Legacy. 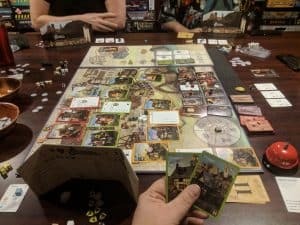 I shared my initial thoughts on this game last week, when I noted that for a game with some rather dated mechanics it was quite fun. 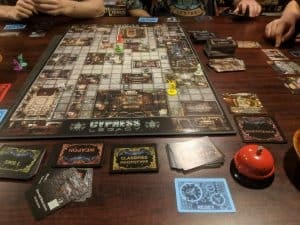 I expected a different experience breaking Cypress Legacy out with my normal Monday night crew. These are a bunch of rather experienced gamers who I wasn’t expecting to like this style of game. 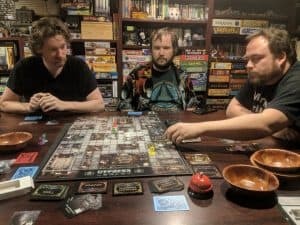 It’s not like we are a bunch of heavy gamers who only dig long euro games, but I expected this group to turn up their noses at things like getting stuck in a storage room because they didn’t roll a 4 or higher. My fears were unfounded. The four of us had a great time. Instead of random misfortune being frustrating it was instead funny. When someone was 1 square away from an inheritance and found a floor trap, instead of cursing, they laughed and passed the die to the next player. When one player started to get ahead, the rest of us ganged up on them, and that wasn’t taken badly. At the end of the night my Mom, who had been sitting upstairs on the main floor, noted she could hear us and that it sounded like we were having a great time and asked what game we were playing. So far I’ve got to say I’m pretty impressed by Cypress Legacy. Yes, it’s got a dated look and that’s even combined with some dated mechanics. The kind of stuff I generally think don’t even belong in a game, but somehow it all works. It’s like the Sushi effect for board games. A bunch of separate ingredients that on their own I don’t really like, but somehow when you put them all together it works. Saturday Deanna and I attended Tori and Kat’s Wedding. Yes KATOR, the couple we play Gloomhaven with. During the day Saturday, in that period between the Wedding and the Reception, Deanna and I had a few hours to kill. We ended up coming home and I was sitting here on my PC talking to Sean on messenger. A couple of weeks ago, Sean had noted that he had finally sat down and learnt Carcassonne on Board Game Arena. Something in that moment reminded me of that and inspired me to start up a game with just the two of us. We played through it pretty much in real time and had a rather good game. I have to say that the BGA version of Carc is really nice. It looks great and it’s fully functional. I didn’t have any issues playing and never had to fight the interface. What I thought was noteworthy was Sean pointing out how different Carcassonne is with only two players. Something I fully agree with. Carcassonne two players is a very different game than even playing with three players. It is a very cutthroat game. With two players, every piece played is either yours or your opponents. That’s my city or yours, my road or yours. A big part of the strategy is trying to steal those things so that they become either ours, or even better, turning something that was yours into mine. You just don’t get that feel when it’s three players or more. With three or more it can basically become multi-player solitaire where everyone does there own thing. That doesn’t happen with two players. It’s much more in your face and I love it. So if you haven’t played Carcassonne two player you really should try it some time. That’s it for my #WhatDidYouPlayMondays. What games did you play this past week?